Guest article from the blog: Fizzy Peaches by Lindsay. As I’m edging closer to the big 3-0 I’ve been trying to take a little more care of my skin. When I was in my early 20’s I was cabin crew so travelled a lot and if I wasn’t tanning on a beach I would be on the sun bed, doing everything I could to retain that year round summer glow. It’s not really until now that I’ve realised it’s really come at a price – I’m starting to get the first sign of wrinkles, especially around my eyes and have a few dark spots appearing from sun damage. 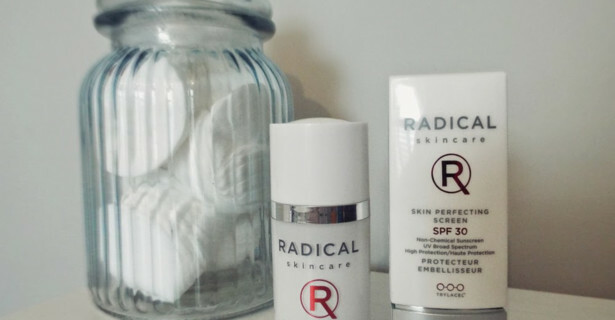 So, you can imagine my excitement when one of the leading skincare brands for anti-ageing – Radical Skincare, got in touch to ask me to trial two of their most popular products! The first of the two was the Radical Skincare Multi Brightening Serum. This product is designed to fight the 7 identified causes of uneven skin tone and reduce dark spots to brighten and enhance the complexion. This in turn evens the skin tone, giving a fresh, radiant finish to the skin. The serum comes in really sleek packaging with a cute nozzle that pops up when you twist it – this is so handy as it means you can easily transport it around without it pushing on the nozzle and going everywhere. I am a firm believer that all skincare products need time to take effect so I’ve been using the serum every day for a month now, after cleansing but before I moisturise to get the best results. The serum is light and absorbs easily into the skin. I feel like it ‘tightens’ my skin without being uncomfortable as it’s moisturising too. After a month of use I’ve noticed my skin is looking a lot more even, I have some red patches around my nose and chin that cleared up and my darker skin patches have even faded a little! I’m really impressed with the product, my skin feels smoother and I feel the product has helped my skin to become a better base for make-up too. Now the shock factor, this product does come at a cost, it’s £95 for 60ml (the sample in my picture is 15ml), however I feel if you want to fight the first signs of aging and dark spots like me, it’s worth shelling out for – my 15ml tube has lasted me ages, after a month of continual use it shows no signs of running out any time soon, a little product goes a long way. The second product was the Skin Perfecting Screen with SPF 30. In the summer I absolutely can’t stand putting suncream onto my face, I seem to breakout as soon as anything with SPF hits my skin, however with my pale complexion I just have to grin and endure it. I’ve been looking for a facial sunscreen for a while now so was hopeful this would work for me. It took a little while to test as the good old British weather just wasn’t sunny enough, however over the last couple of weeks I’ve managed to get some time to enjoy the sunshine and most importantly give this a go on my face. The cream is easy to apply and doesn’t leave the skin greasy at all. I applied 30 minutes before I left the house and was pleased to find it no different to a moisturizer. The skin perfecting screen contains light defusing pigments to reduce the appearance of wrinkles and brighten the complexion, I didn’t feel I needed to apply make-up as it gave me a soft dewy glow – so far so good! After a day in the sun I returned without burning at all and although it had been a hot day, the sunscreen didn’t make my skin any more greasy, which means no more nasty breakouts, I was so pleased! The Skin Perfecting Screen is £38 per 40ml, which again I think is worth it if you are looking for something you know is going to offer strong protection to the sun, after all – your skin is worth protecting and will save you money in the long run if you do this now.